Livermore, CA, February 4, 2010 – The Course at Wente Vineyards, an 18-hole award-winning golf course designed by Greg Norman, has achieved designation as a “Certified Audubon Cooperative Sanctuary” through the Audubon Cooperative Sanctuary Program for Golf Courses, an Audubon International program. “To reach certification, a course must demonstrate that they are maintaining a high degree of environmental quality in a number of areas,” explained Jim Sluiter, Staff Ecologist for the Audubon Cooperative Sanctuary Programs. Those categories include: Environmental Planning, Wildlife & Habitat Management, Outreach and Education, Chemical Use Reduction and Safety, Water Conservation, and Water Quality Management. Sluiter also added, “The Course at Wente Vineyards has shown a strong commitment to its environmental program. They are to be commended for their efforts to provide a sanctuary for wildlife on the golf course property.” Glenn Matthews, Superintendent at the Course at Wente Vineyards spearheaded the certification process. Christine Wente, Fifth Generation Winegrower and Vice President of Hospitality for the family-owned winery, golf course, restaurant, and event center, stated "This certification by Audubon International of The Course at Wente Vineyards is a confirmation of a long held philosophy at our family winery where we have been implementing sustainable and environmentally sensitive practices since my great-great-grandfather founded our company in 1883. We are excited and honored to have this certification, which will further enhance our guests' experience at our unique property where wine, golf, concerts and fine dining converge in the historic Livermore Valley." The Audubon Cooperative Sanctuary Program for Golf Courses is endorsed by the United States Golf Association. It provides information and guidance to help golf courses preserve and enhance wildlife habitat, and protect natural resources. Golf courses from all over the globe, numbering 797 total, with 52 in California have achieved this certification. For more information on golf and the environment, please visit www.golfandenvironment.org. For more information on Audubon International, please visit www. auduboninternational.org. The Course at Wente Vineyards opened in July 1998. 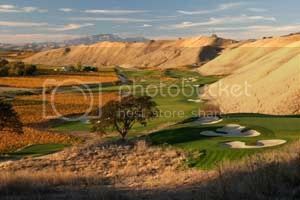 Designed by golfing great Greg Norman, the 18-hole championship course is a picturesque 7,181-yard, par-72, upscale, daily-fee golf course tucked away in the scenic, rural Livermore Valley, 50 minutes east of San Francisco. With three distinct topographies—native woodlands, mature vineyard and rolling hills of natural grasslands—The Course at Wente Vineyards offers extraordinary visual panoramas and a diversity of play unmatched in the Bay Area. For tee times call (925) 456-2425 or visit online at www.wentegolf.com. The Course is located at 5040 Arroyo Road in Livermore, CA. The country's oldest continuously operated family-owned winery, Wente Vineyards is led today by the fourth and fifth generations of the Wente family. More than 125 years of committed stewardship to the land has led to the development of Wente Vineyards’ Farming for the Future, a system of sustainable viticultural practices designed to produce the best quality wines with the least environmental impact. This philosophy extends to all aspects of winery operations, where energy efficiency, waste reduction, recycling and social responsibility are all integral to the culture.